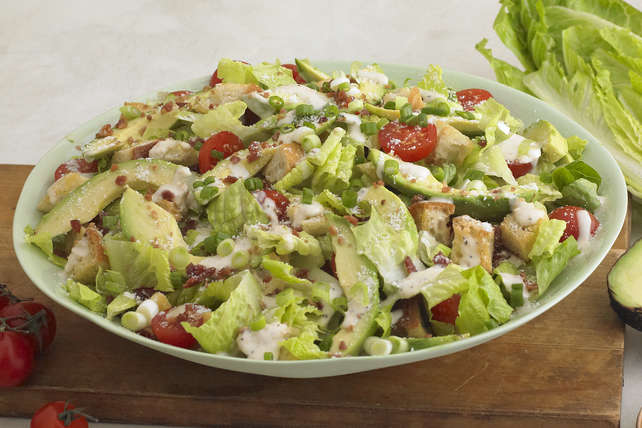 A few simple add-ins transform a green salad into our Bacon and Avocado Caesar Salad. Tomatoes, avocado and bacon bits are served on a bed of crisp romaine lettuce with Caesar dressing and Parmesan cheese for a tasty take on the classic Caesar salad. Prepare using Kraft Creamy Caesar Dressing and Kraft 100% Parmesan Grated Cheese. You'd never guess that this great-tasting version of the classic salad can be part of a healthy eating plan. Not only does the salad provide an excellent source of vitamin C, but the lettuce also provides an excellent source of vitamin A.